We've seen battery-powered all-in-one desktops from Sony and Lenovo since the launch of Windows 8, but Asus has a different approach to merging desktop computing power with wireless mobility. With two CPUs, and two operating systems, the Asus Transformer AIO is one of the more unique computers we've seen here at the show. 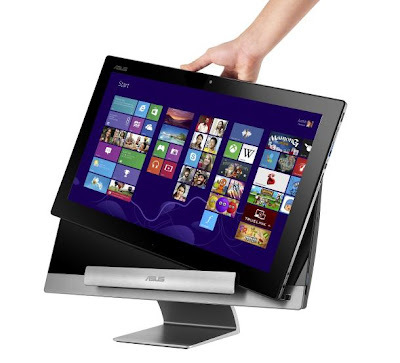 In its desktop mode, the Transformer is a Core i5- or Core i7-powered Windows 8 all-in-one with an 18.4-inch IPS touch screen. Disengage the display, and you find yourself holding an Android Jelly Bean-based tablet with a Tegra 3 chip inside. An 18.4-inch screen sounds large for a tablet, and small for an all-in-one, so yes, it involves some compromise in both aspects. It's not quite as large as you might want in a desktop, and it's perhaps not quite as portable as you'd want from a traditional tablet. Still, it's not too hard to imagine plunking the Transformer AIO down on a desk and then grabbing the tablet when you move between rooms. Asus makes no mention of data continuity between the two modes, so you're likely on your own as far as bringing your documents and media with you. Fortunately, the cloud can make that easy, at least when it's not down. Asus says the system has a 1,920x1,080-pixel display, and that it will retail for $1,299 with a Core i3 chip, with Core i5 and Core i7 variants also forthcoming. The company is not yet addressing battery life for the tablet, or availability. From its basic design, though, Asus's new system is only the latest data point along an industry-wide trend that has manufacturers merging and experimenting with the basic forms of previously familiar computing devices.